The Messerchmitt Bf109G-4 was a short lived variant. It was a G-2 development that was quickly phased out, when production standardized on the G-5/6 variant. The main visual differences were the larger main wheels with their associated upper wing bulges, and a larger tail wheel. 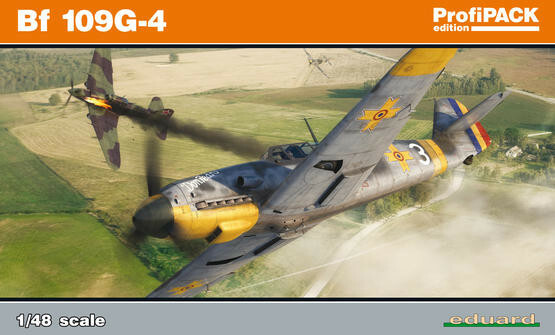 The Bf109G-4 served on many fronts and they were flown by many of the aces on the Eastern front, as well as by several of Germany's allies. This is the logical progression of Eduard 109 kit releases, and it is essentially a re boxing of several existing sprues, along with new decals and instructions. That is not damning with faint praise, let me assure you that those sprues are excellent! The G-4 was an interim variant with a mix of G-2 and G-6 parts so it is natural for Eduard do the same with the available moldings. They combined the common F/G sprues, the G-2 fuselage and the G-6 wings to create an accurate G-4. Because this is a Profipack kit there is also a fret of colored photo etch and masks included. A model more than detailed enough for most can be produced with kit's contents. The plastic is of course very nice, with a smooth satin finish that will take paint well. The edges of parts are thin, the surface detail is good and the engineering is very well done. Each elevator has two halves; this allows for an easy bevel to accommodate the separate control surfaces. The ends of exhaust stubs are hollow and minor details are there, such as brand names on tires. The pièce de resistance is the riveting detail. It is very fine, subtle and complete. It will create that ultra realistic look under a coat of paint. The clear parts are thin, crisp and they have exceptional frame detail. There are raised rivets on the canopy frames as appropriate. Every single variation of canopy is catered to, with three windscreens, five hinged hoods and two head armor variations. One of my personal favorite features of the kit is that there is a clear plastic fuel line for the cockpit. If you paint it but leave the center section clear, it will perfectly recreate the fuel line of the 1:1 original. It wasn't my ideal choice of where to route the fuel lines on a war plane, but that is how it was! In short, the plastic will make an gorgeous model, even if not another thing is done. Here is the basis of the trademark Eduard "Weekend Edition". Of course, THIS is a Profipack kit! That means that you will also get a fret of color photo etch, masks and a good selection of marking options. The photo etch is lovely, as you would expect from Eduard, pioneers emeritus of the medium! It has all of the things you would expect, i.e., an instrument panel, radiator screens, trim adjustment chains, rudder pedals, seat belts and a few other miscellaneous bits. The instrument panels and belts are color, most of the rest will need to be painted. The masks are self explanatory, but are made from Tamiya style tape. Not that a Bf109 is the hardest thing to mask, but as I get older and lazier, I am developing an appreciation for masks. With the addition of the masks and p/e, the already gorgeous plastic is taken to the next level, and the level of detail is sufficient for most modelers. One of the nice things about the Profipack kit is the markings options. Romanian, Italian, North African, Eastern Front in RLM 74/75/76 and of course one of Eric Hartmann's well known mounts. In all seriousness, the decal options comprise an interesting and varied collection, and they should be able to cover almost any taste without the need for aftermarket decals. Their printing is excellent, with clear stenciling and bright colors. They seem a bit glossy, but I suspect they would settle down nicely under some decal solvent and a clear coat. The instructions are in the standard clear drawings style of Eduard's last 10 years. They are printed in color on glossy paper and stapled together into a booklet form. They are easy to read and understand. There are 16 pages of approximately A4 size, including 4 views of each of the five options are included, plus separate stencil and masking placement guides. This kit fits beautifully and is accurate when done, from all accounts. In the hands of a skilled modeler it can be taken to just about any level, short of opening up engine bays, with what is in the box. I recommend this kit to the Luftwaffe enthusiast and I would like to thank Eduard for the review sample.